Summary: Jacob Portman, a 16-year-old boy, goes to an island called Wales to find out the truth about his grandfather’s past after he was murdered by what Jacob thought was a make-believe creature. He saw Emma, a girl who could control fire and she takes him to meet Miss Peregrine in a time loop set back in the 1940s. Jacob hangs out with the other peculiar children but then he was told that that he was the only one who can see the “hollows,” the monster that killed Jacob’s grandfather. He knows that he is the only hope they have for safety. Can he destroy the hollow or leave the time loop to be destroyed by the hollow? I started reading it because… I heard it was a really good book, and that it was scary and a mysterious and curious read. It was also listed in my school’s Bulldogs Reads. Main character(s): If they were in a yearbook, they would be voted: The best guy you want to hire when you are looking for a monster to kill!! Six Word Recap: Are Peregrine’s Peculiar Children still alive? This book reminded me of The Hunger Games because… when Katniss saw Peeta being injured, she could just have left him there dying but she risked her life and found a medicine that cured him, just like in this book Jacob knows that he is the only one that can see the “hollows” and he is the only one who can save the children. He could just have gone back to his time but he stayed there and helped them. This entry was posted in Read This!, Teen Powered and tagged Book Shorts, books, Madison MS, mysteries, spooky, written by teens on November 14, 2012 by Teen Blogger. Thanks to Ms. Bell for inviting me to speak to all 5 of her reading classes yesterday! Here are some of the books I talked about, plus links to homework help at the library and online, and also to our blog. This entry was posted in Blog Love, Homework and tagged books, Madison MS on October 26, 2009 by pushtotalkteens. 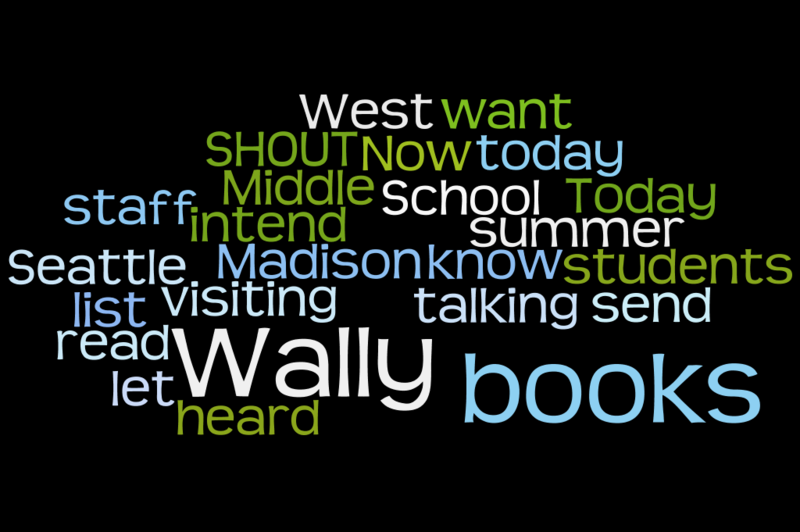 I just spent the day with the sixth-grade students of Ms. Braaten’s reading classes. Thanks to all the kids who recommended reading material to me and to their classmates! Here’s the link to our homework page. If you forgot the titles of the books I brought to talk about, here they are, ready for you to request. Just click on the title. Laika by Nick Abadzis – the story of the first dog in outer space. Down the Rabbit Hole by Peter Abrahams – Ingrid solves mysteries that might stump even her hero, Sherlock Holmes. The Name of This Book is Secret by Pseudonymous Bosch – remember that the name of this book is secret! This entry was posted in Homework, Tidbits and tagged books, Homework, Madison MS on March 10, 2009 by pushtotalkteens. I just spent my morning at Madison Middle School with the sixth graders of Ms. Mock, Ms. O’Donoghue, Ms. Ovens, and of course, Ms. Chambers, the school librarian. Thanks to all the kids who recommended reading material to me and their classmates! Here’s the link to our homework page. If you want the Online Homework Help service at Tutor.com, scroll down about halfway. This entry was posted in Book Lists, Homework, Tidbits and tagged Madison MS, school visit on November 17, 2008 by pushtotalkteens.